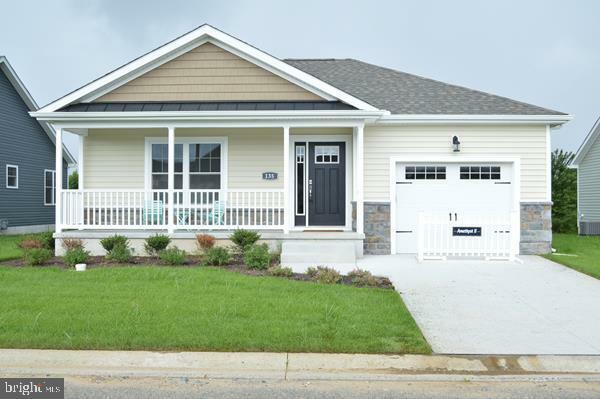 Immediate delivery--our popular NEW 2 bedroom model! This floor plan features a spacious open floor plan where the living area opens to the dining and kitchen areas. Cottage style front porch to sit and relax on and home features numerous upgrades! Conveniently located behind Redners Grocery Store and a small shopping center, this 55 plus community with affordable HOA fees and a recently added open Community Pavilion with Bocce Ball, Grilling stations, horseshoes and more. Please visit the community for details and more info. Close to Rt. 1 Rt. 13, Dover Downs, Beaches, Entertainment and tax free shopping.